Four Fathers Distillery owner Tim Daniels smelling a batch of his Black Copper Rum. A steam-boiler powered by new solar technology manufactured in Jacksonville is now being used to make whiskey, bourbon, vodka and rum at a local distillery. Jacksonville-based Artic Solar recently installed the solar steam boiler, powered by its patented XCPC solar thermal collectors, at Four Fathers Distillery in Northwest Jacksonville. Four Fathers was founded in 2015 and started producing small-batch products for other distilleries the next year. Owner Tim Daniels said he produces specialty product lines for some of the biggest distilleries in the world. 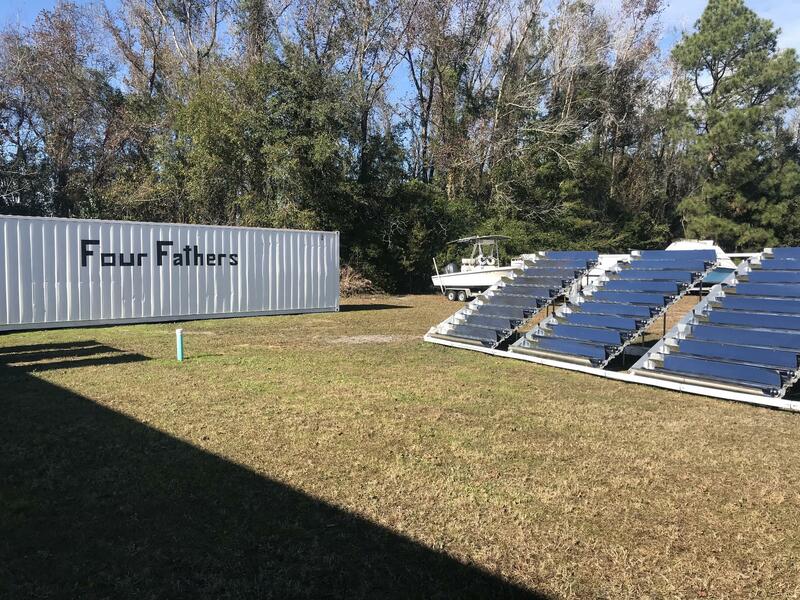 He hosted an open house on Friday to show off the solar technology he’s incorporating into his business, and to spread the word that Four Fathers is getting ready to start selling its own products. “By the end of the month, we should have our product out there,” said Daniels. Artic Solar President and cofounder Bill Guiney claims the technology is a game changer for the solar heating industry. Solar panels outside of Four Fathers Distillery in Jacksonville. While older technology works fine for homes, Guiney said his new thermal collectors can produce much higher temperatures, making it viable for businesses like Four Fathers Distillery. Four Fathers owner Tim Daniels admits he won’t see a return on his solar investment any time soon. Arctic Solar estimates the system will pay for itself in three-to-8.5 years, depending on the type of fuel it’s replacing. But Daniels wasn’t solely motivated by cost. In addition to the new solar-powered steam boiler, Four Fathers Distillery still has two gas-powered boilers, for when sunlight isn’t in large supply. Guiney said he haven’t sold the technology to any other companies yet, but he’s in talks with several that are interested. He said Artic Solar is also working on two projects with BART, the public train system in San Francisco, to evaporate wastewater in train yards. Anheuser-Busch is also interested in the technology. Guiney said he’s been in communication with the company’s sustainability team in St. Louis.